We have a beautiful space for you teach in our large bank barn or on our 50 acre property. We would also help promote your class using our email list and social media. If you are interested in offering a specific class and have professional or teaching experience in your field, we would like to review your proposal for future consideration. Email proposals to nathan@dragerfarms.com or call 717-758-4026. You may also apply online here. Drager Farms is now carrying pastured pork & poultry products from Mirror Image Farms, located in Marietta PA. We chose to work with Mirror Image Farms because they have similar values and animal raising practices as our own. Because of this partnership, we will be able to offer pastured pork and poultry to our customers once again. Check out the “Mirror Image Farms” section of our online shop to see what we have in stock. HIPCAMP: Come Stay With Us! 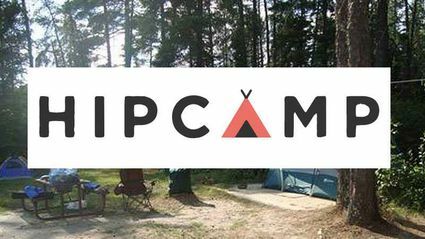 We’re happy to announce our participation in the Hipcamp community! Hipcamp is a way to connect landowners like us – who want to keep our land undeveloped – with responsible, ecologically-minded campers. Our camping area is pretty primitive right now, but if this takes off, we’d love to add more amenities for campers in the future. One of the best things about staying here is that there is so much to see and do nearby. Natural beauty surrounds us! Riverfront Park, located along the Susquehanna River, is within walking distance. Biking, boating, walking, and bird watching are popular activities at the park. Hiking trails and rock climbing are a short drive away at Chickies Rock. You can also tour our farm, meet our animals, and check out our retail farm store too while you’re here! We finally started work on our barn renovation project. Starting on the barn is a big deal for both myself and my fiancée, Christel. The barn represents “community” for both of us and the additional space will give us room to do more of what we love: sharing our unique skills and knowledge with others. I hope to offer workshops about different things I’ve done here on the farm as far as fencing, my grazing practices, and how I’m raising my livestock. Christel will have her own space to teach yoga and other healthy living workshops. And we both look forward to having farm-to-table dinners! ? The possibilities really seem endless when we think about the kind of stuff we could end up doing here. We started a GoFundMe campaign if you’d like to help us with our latest endeavor. Any support would be greatly appreciated!